Bulletin 1732D and 1732E ArmorBlock® I/O provides low-cost, hardened, digital I/O suitable for on-machine use. Mount it anywhere on a machine for automotive, material handling, and semiconductor applications, or when diagnostics and local control are not needed. 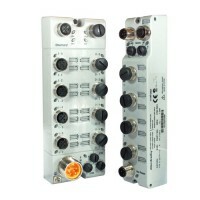 ArmorBlock I/O is available for DeviceNet™ and EtherNet/IP™ networks. In addition, Armor WeldBlock I/O is suited for use in typical welding applications and is ideal for end-of-arm robot applications.